So today's outfit is inspired by one my favorite blog God's Favorite Shoes. One thing I love about Ms. Reiko, is that she is a pro thrifter. 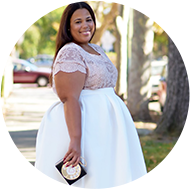 She puts together the most versatile and fabulous looks for a minimal amount of cash. She really should write a book on thrifting, because her skills are crazy. The majority of my look was bought from a consignment Clotheshorse (here in Dallas off of Preston Rd). Clotheshorse is high end prices start from around $20 and can go over $1500 (for high designer goods). I must admit its my favorite consignment shop here. 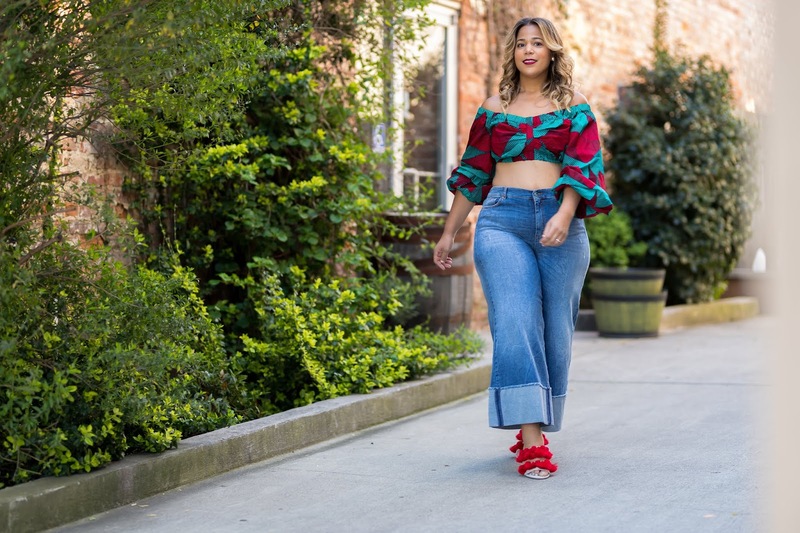 There are not a lot of plus size duds, but if you look hard enough you can find some treasures. My total check for these 3 pieces was $86. Although I have not mastered low end thrifting, I am learning...thanks to Reiko. I also paired this outfit with a pair of mustard tights from We Love Colors! I hope God liked them, I know all the little girls at church were looking at them. I super excited that Clotheshorse gave me a chance to try this Lafayette 148 Skirt. Lafayette 148 frequents stores like Neimans & Saks. They do extend to plus sizes, but generally the price tag on these items are around $300. I found this skirt to fab and I actually fit into this size 16. This skirt actually is the best fitting skirt that I have bought off the rack. The waist fits insanely perfect. I will definitely start looking at this brand more. I also love the little waist detail. I am definitely stocking up my tights for the fall and winter. So far this season I have bought plum, mustard, and black. I love adding colors to the collection. 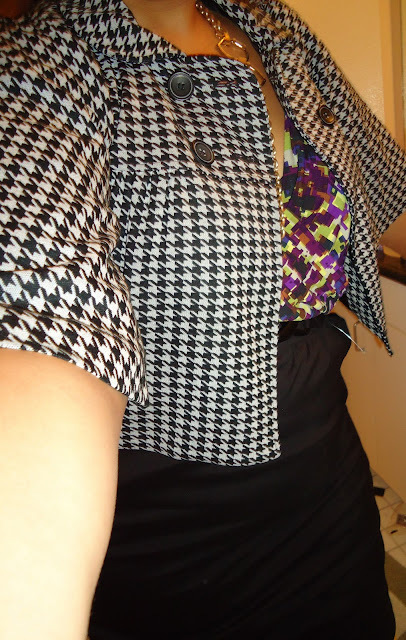 I experimented a little with mixing prints and added this houndstooth printed caplet. I really liked it together, so I definitely will wear this in the future. The caplet came from a store in Cartersville, GA (I purchased a year ago and can't remember the name of the boutique) and it is actually a medium....and it works fabulously. and congrats for the great picks! I love Reiko's blog and style. Yes, she needs her own book on thrifting. I like the houndstooth thrown in. You look great. i say AMEN! and LOVE the houndstooth! I love the mustard tights! So cute! First of all...SHUT THE HECK UP! I was shocked to see my name!!! Thank you so much for the compliment. Girl, that thrifting in me comes from being financially challenged! I love love love your picks! And that Houndstooth capelet with that printed top....MAJOR! You definitely followed my golden rule when thrifting...try on things that might not be your size! I get surprised every time. 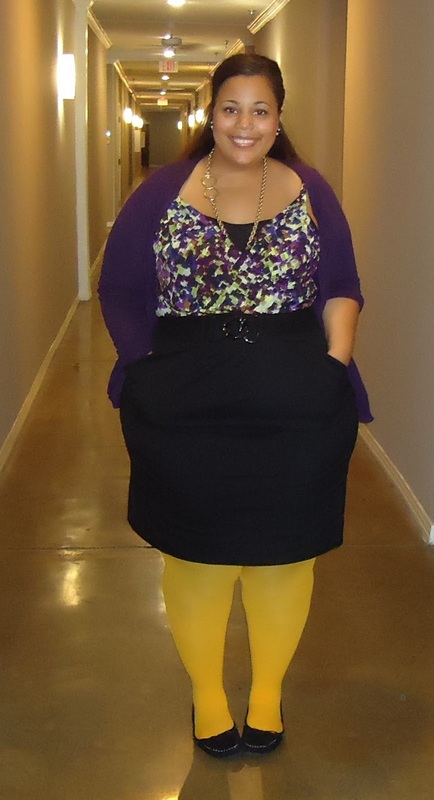 By the way, I'm homies with God...he says he approves of the Mustard tights! ...I am so blushing right now from your compliments! LOL! love,love, love this look. The mustard yellow is sooo daring and i love that color!!! Do WE LOVE COLORS tights run on the small size or big...? I love love love the mixed prints. This is one thing that I can't seem to do properly! Love the houndstooth check with that blouse. Would never have thought of it. I've really got to start just TRYING things! The outfit looks great on you. I love the mismatched print with the jacket and the top. I also adore your mustard tights. I am in love with colorful leggings but I am still not daring enough to try them on. I live in Japan where young women always wear some funky tights or leggings. Want to be courageous enough to buy one in red and one in argyle. Love this look, colored tights are fab!! 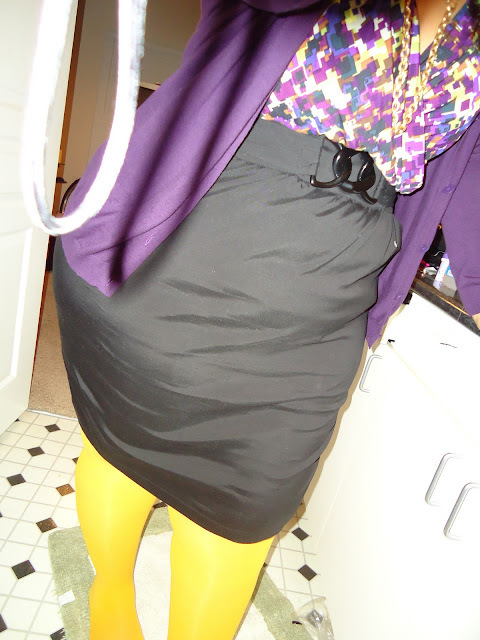 I love mustard tights they can make an outfit.